Illustration by Natasha S. Johnson. 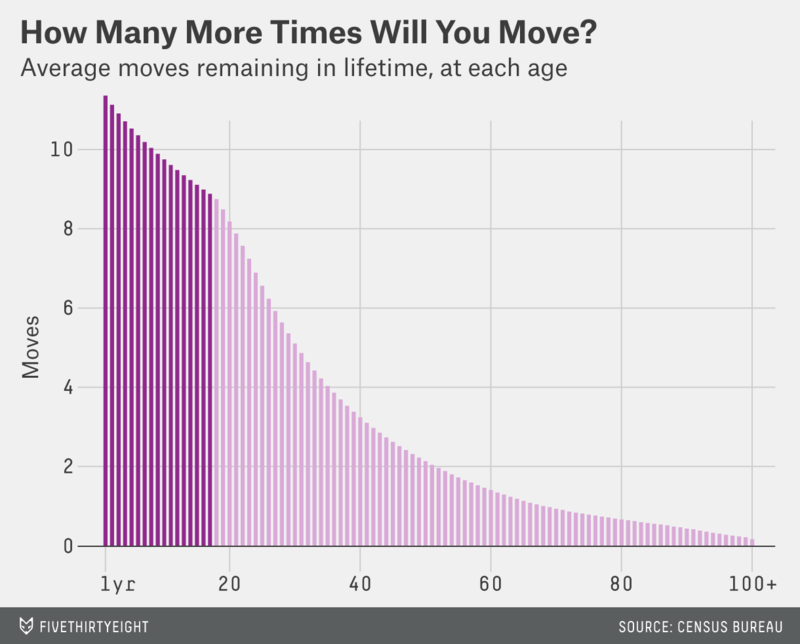 How often does the average person move? I’m 28 years old and I’ve moved 15 times in my life. Is this a normal amount? A person in the United States is expected to move 11.4 times in his lifetime. So Ron, at 15 homes, you haven’t only moved more often than the average American your age — you’ve relocated more often than the average American will. You are, however, in an age group that packs up more frequently. The average 18-year-old in the U.S. will have only moved twice, but a 30-year-old will have done so six times. The U.S. Census Bureau doesn’t directly ask Americans about the total number of times they’ve moved but estimates those figures using two pieces of information: which age groups are most likely to move in a given year and the overall composition of the U.S. population. The last time the Census Bureau calculated this was in 2007, when it found that a typical American will move 11.7 times in their lives. We redid the math using the most recent data (2013 for mobility and 2010 for population estimates) and reached a slightly lower number of 11.3 lifetime moves. Between 2012 and 2013, 28 million Americans 15 and older moved — that’s 11 percent of the population in that age group. But when you take a closer look at who they were, you see there’s a lot more to it than age. The wealthiest individuals are the most likely to stay put: 7 percent of Americans with an annual income of $100,000 or more moved, compared to 13 percent of those earning $5,000 or less. That might seem strange if you assume the term “mobility” normally has a positive connotation. But it isn’t always a good thing. When surveyed by the Census Bureau about why they moved in the past year, people gave reasons including searching for a better home (cited by 15 percent of movers), cheaper housing (8 percent), and foreclosure or eviction (2 percent). Sometimes staying put is a sign of stability. So, if one of your moves took place recently, the data suggests you’re less likely to be rich, Ron. It also shows that you’re less likely to be white. Ten percent of non-Hispanic white Americans moved between 2012 and 2013, compared to 13 percent of Asian-Americans, 13 percent of Hispanics and 14 percent of African-Americans. Of course, none of these factors can really be understood in isolation. We know that older Americans are more likely to be wealthy ones, too. And we know that the median net worth of a black American household is $11,000, compared to $142,000 for a white American household. But the fact that all of the (many) factors that affect geographic mobility appear to be related is not a reason to solely focus on just one (in this case, age). So, treat the numbers above with a little caution. Many of your fellow 28-year-olds might not see themselves in a chart that shows they should have moved 5.7 times. But at 15 moves, I probably don’t need to remind you that averages don’t capture everyone, Ron.